O'Shea Jackson Jr. and Corey Hawkins wears black and monochrome black Converse “Chuck Taylor” All Stars in the film. 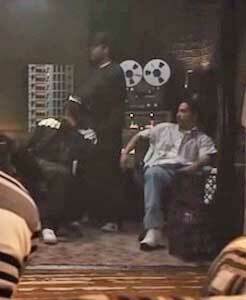 Ice Cube wearing black and white chucks in the studio. In a crack house in Compton, Eric Wright (AKA Eazy-E, portrayed here by Jason Mitchell) arrives to make some money. He lives the life of a dope dealer, and takes all the risks that come with it. These risks become evident to us as a drug bust occurs and SWAT raids the house. Eric escapes into the streets of Compton with his life, but he knows his luck’s going to run out soon. Andre Young (AKA Dr. Dre, portrayed here by Corey Hawkins) is listening to old school soul jams in his room, when he gets into a fight with his mom. She doesn’t believe in his dreams of making music for a living, instead insisting that he gets a real job before kicking him out of her house. We then cut to O’Shea Jackson (portrayed by O’Shea Jackson, Jr.) who is riding to school on the bus, when a pair of Bloods stop the bus because some of the kids were flashing the Crip gang sign at them. He warns them of the dangers of messing with the wrong people, and acting stupid in the face of violence. These three are the core of what would become the world’s most dangerous group, N.W.A. (AKA N*ggas With Attitudes). N.W.A. decide that Eazy should be the one to rap “Boyz In Da Hood” after a failed attempt at recording with some East Coast artists. After an ill-fated attempt to get O’Shea’s (now going by Ice Cube) raps heard on the local nightclubs stage, Dre and Eric resolve to start their own record label. 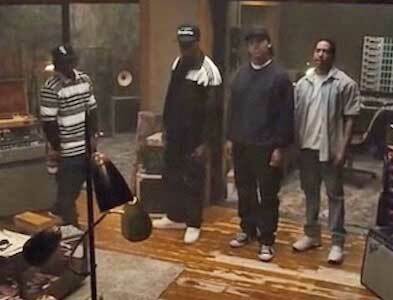 They recruit fellow musicians MC Ren and DJ Yella to assist in recording their first song, “Boyz In Da Hood”. When the New York group they hired can’t cut it, Dre decides to have Eazy take a stab at it, and with some coercing and coaching, they succeed in recording an instant classic. The song and the group blow up around Compton, and eventually catch the ear of producer Jerry Heller. He is able to get them a deal with Priority Records. The group goes on to record their debut album Straight Outta Compton which includes such classic hits as “Gangsta Gangsta”,“Dope Man”, “Straight Outta Compton”, and “F*ck The Police”. The group then goes on their first world tour, but things fall apart quickly as Ice Cube is suspicious of Jerry’s motives and Eazy’s loyalties. He realizes he’s not getting paid in full and decides to leave the group, urging Dre to do the same. Ice Cube rocking chucks before a show. 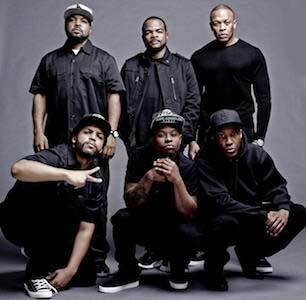 After having his contracts looked over by Suge Knight, Dre decides to leave N.W.A. and form his own label, Death Row Records. We see all the members of N.W.A. move on with their careers, to varying degrees of success. Dre takes Death Row to new heights with acts like Snoop Dogg and 2Pac, while Cube pursues a career in film to accompany his multi-platinum solo career. Eazy ends up realizing that Jerry was as bad as Dre and Cube said he was, as he watches his career decline heavily over the next few years. He eventually contracts the AIDS virus, which brings the former members of N.W.A. back together as they pray for a miracle. Unfortunately, that miracle never comes as Eazy-E dies from complications of AIDS in 1995. 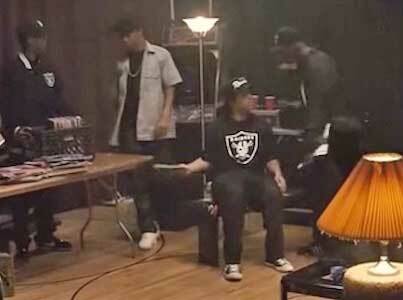 The film ends with an epilogue that shows where Dre, Yella, Ren and Cube are now and the influence N.W.A had on an entire generation of rappers and musicians. N.W.A gain inspiration for their song “F*ck The Police” (Dre wears black chucks). The movie is a must see for any fan of hip-hop as N.W.A. are one of, if not the most important group in the genre’s history. It’s well directed, and the actors portraying these musical legends bring great depth and emotion to their roles. There is a lot of history to cover in two and a half hours, but it never feels like the movie drags or is overstuffed. The story of these five kids from Compton can resonate with anyone who’s ever had to overcome adversity or rise above their station in life. The three main cast members (bottom L to R), O’Shea Jackson Jr., Jason Mitchell, and Corey Hawkins with their surviving counterparts, Ice Cube (top left),Dr. Dre (top right), and director F. Gary Gray (top middle). Dr. Dre wearing monochrome black chucks. The best chucks scene in this movie occurs after Dre gets in a fight at the nightclub he works at. Eazy bails him out the next morning and we see Dre is carrying his shoes around in a plastic bag. It’s a pair of all black chucks and we get a good look at them as he has to replace them. 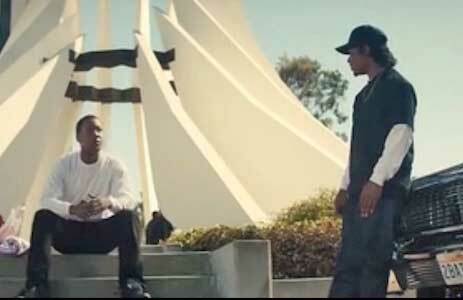 This is also the scene where Eazy and he decide to start their own label, so not only is it a great scene for chucks, but an important scene for the film as well. Dr. Dre lacing up his monochrome black low top chucks. Straight Outta Compton. (2015) O'Shea Jackson Jr., Corey Hawkins, Jason Mitchell, Neil Brown, Jr., Aldis Hodge, Marlon Yates, Jr., Cara Patterson, Alexandra Shipp, Paul Giamatti. Directed by F. Gary Gray.